Was your ancestor a sharpshooter? If you have a photo of him, let me post it here. Co. A, McGowan’s Sharpshooters (Co. H, First South Carolina). 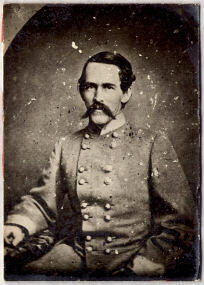 Benson was captured on a scout at Spotsylvania in May, 1864 and sent to Elmira prison in New York. He escaped and returned to his regiment, serving until the end of the war. Courtesy South Carolina Historical Society. Copyright SCHS. F&S, Fifth Alabama. Commanded Rodes’sBattle’s Sharpshooters and Rodes’s Division Sharpshooters. 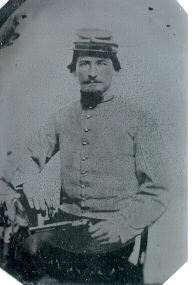 Blackford's sharpshooter battalion was the first to be so organized in the Army of Northern Virginia in January, 1863. Co. B, Twelfth South Carolina. Commanded McGowan’s sharpshooters 1864-65. After the war he wrote Lee's Sharpshooters, detailing his battalion's exploits. F&S, Fourth North Carolina. Osborne commanded the sharpshooters of Ramseur's brigade at the Wilderness. 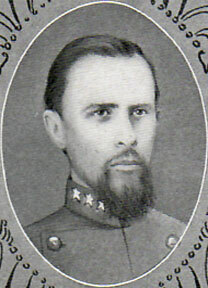 Later promoted to Colonel. 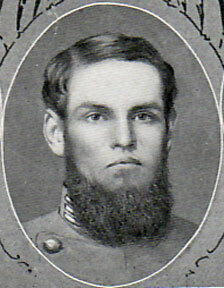 Brown commanded the First North Carolina until most of his regiment was killed or captured at Spotsylvania on May 12, 1864. 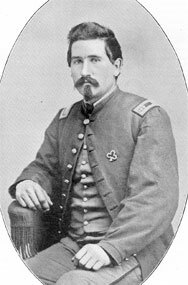 In August 1864 he took over command of Rodes's Division Sharpshooters, a post he held until his capture at Ft. Stedman on March 25, 1865. Co. F, First North Carolina. Like his commander, Col. H. A. 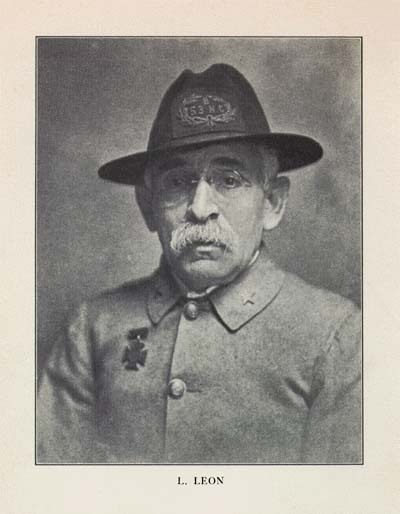 Brown, Boone survived the destruction of his regiment at Spotsylvania and joined Rodes's Division Sharpshooters, as did many of the officers and senior NCO's of the First North Carolina. Company B, Forty-third North Carolina. 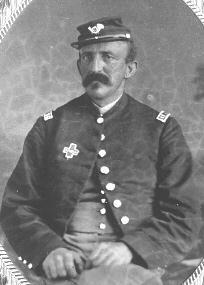 "Ed" Stitt commanded the sharpshooters of Grimes's brigade, Rodes division. Company B, Fifty-third North Carolina. 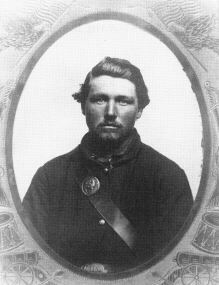 Leon volunteered for the sharpshooters of Daniel's (later Grimes's) brigade in the spring of 1863, when the brigade joined the Army of Northern Virginia after Chancellorsville. He fought at Gettysburg but was captured the next spring at the Wilderness and spent the rest of the war in prison. 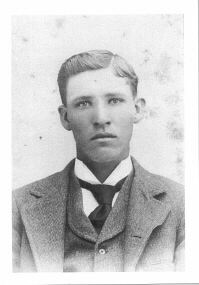 In 1913 he wrote his memoir, Diary of a Tarheel Confederate Soldier. F&S, Third Battalion Georgia Sharpshooters. 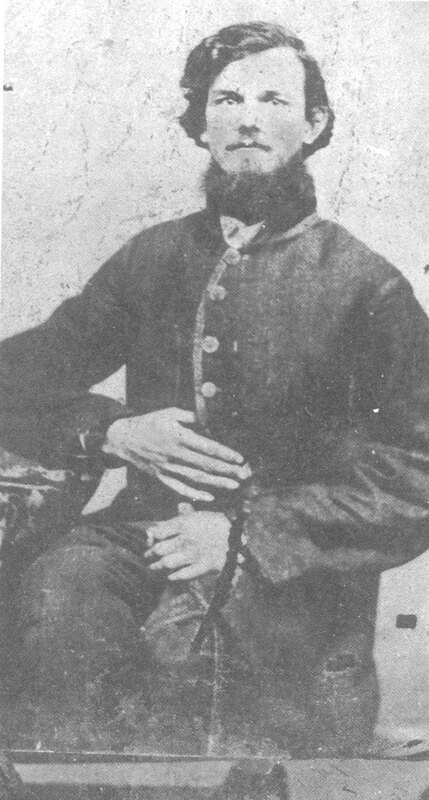 William Simmons was elected a lieutenant in the Sixteenth Georgia and later transferred to Third Battalion Georgia Sharpshooters where he commanded Company C. Captured by Custer's cavalry at Guard Hill, VA, in August, 1864, he spent the rest of the war in Fort Delaware prison. 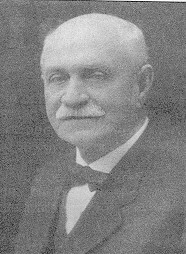 He was elected solicitor general of Georgia after the war and spent many years as a university trustee. He died in 1931 at the age of 91. Co. A, Forty-seventh North Carolina. 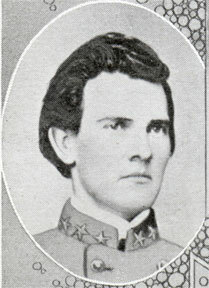 In 1863 Lieutenant Bunn was assigned to command the sharpshooter company of his regiment and later, as a captain, the sharpshooters of McRae's North Carolina brigade. He was wounded on the picket line on March 25, 1865, which kept him out of action for the rest of the war. Afterwards he became a lawyer and politician, serving three terms in the US House of Representatives. 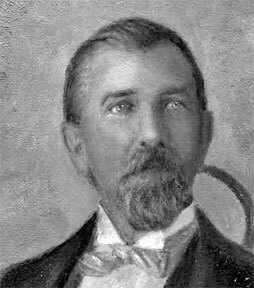 In 1880 he supported the presidential candidacy of former Union general Winfield Hancock. 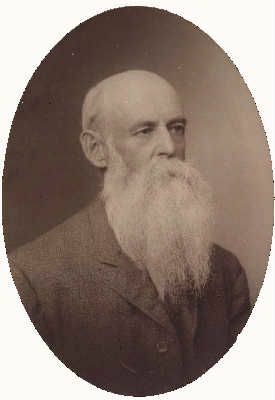 Bunn died in 1907. Company H, Seventh Tennessee. 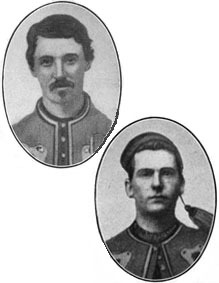 Fergus Harris (right) enlisted as a private in 1861 and was eventually promoted to captain. He commanded the sharpshooters of Archer's brigade, and was wounded eight times, the last on April 2, 1865, while trying to stem the Union breakthrough at Petersburg. 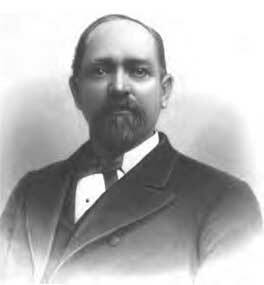 After the war he became a businessman, and died in 1905. Here he poses at a reunion with his former brigade commander, Brig. Gen. William McComb (center) and his adjutant, Capt. John Allen (left). Co. E, Third Battalion Georgia Sharpshooters. 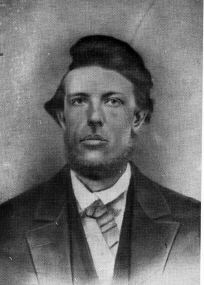 Milton Barrett enlisted in the Eighteenth Georgia in 1861 and transferred to the sharpshooters in May, 1863. He was captured at Guard Hill, VA, in August, 1864 and sent to Elmira prison, where he died of smallpox on February 12, 1865. He is buried there in Grave #2108. Co. F, Third Missouri. Twenty-four year old Texas farm boy Charles Ingram enlisted on December 31, 1861. Captured at Vicksburg in 1863, he was paroled and became a Whitworth sharpshooter in Gen. Patrick Cleburne's division of the Army of Tennessee. 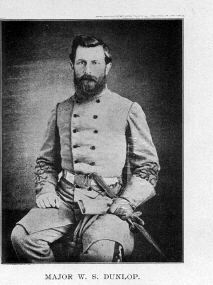 Near the end of the war his brigade (Cockrell's) was sent to Fort Blakely, AL. After the fort's fall Ingram made his way home with his Whitworth, which today is in the 45th Division Museum in Oklahoma City. Co. K, 148th Pennsylvania. 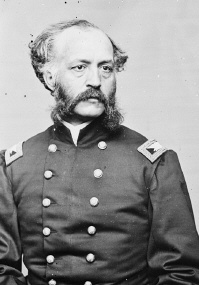 Brown led a daring raid on Confederate positions at Petersburg on the night of October 27, 1864. His actions won him a Medal of Honor and brevet to major. 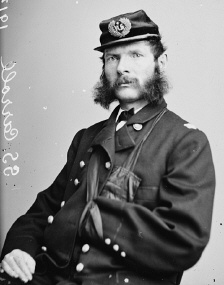 Organizer and commander of "Kane's Bucktails," later the 13th Pennsylvania Reserves. Twice severely wounded, he resigned because of their effects and ill health in 1863. 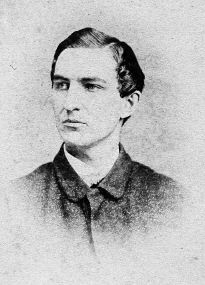 A lawyer and ardent abolitionist before the war, Birney was one of the Union's many political generals. Unlike most of them, however, he developed into a competent military man. 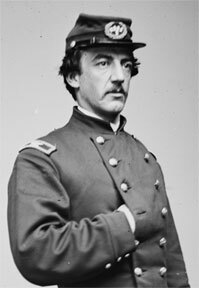 Often in brigade and division command of the 1st and 2nd U.S.S.S., he developed an appreciation of light infantry. 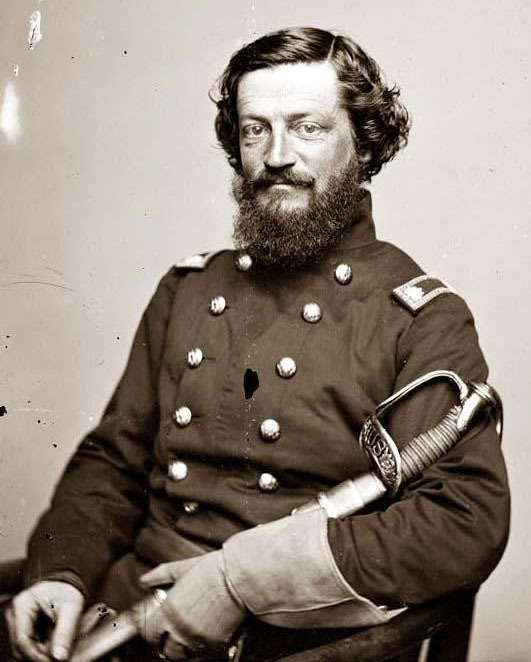 Shortly after being promoted to corps command he was stricken with malaria and died soon afterwards on October 18, 1864. F&S, 1st U.S.S.S. 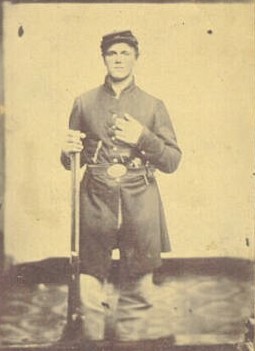 Ripley, shown here in a prewar militia uniform, was appointed lieutenant colonel of the sharpshooters in 1861 and served in the Peninsular campaign. 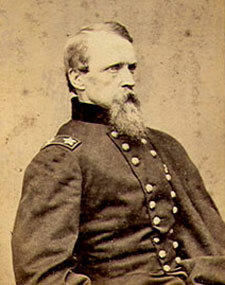 He was severely wounded at Malvern Hill (and later received the Medal of Honor) in July and never returned to the field. After the war he wrote A History of Company F. He died in 1905. Company I, 155th Pennsylvania. Both men served in the sharpshooter company of 1st division, 5th Corps, organized in July 1864 at Petersburg. The three division companies were later consolidated into a sharpshoooter battalion under corps control. 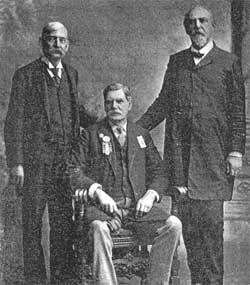 Both men survived the war and were mustered out in 1865. 1st Company Sharpshooters ("Brady's Sharpshooters"), 16th Michigan. 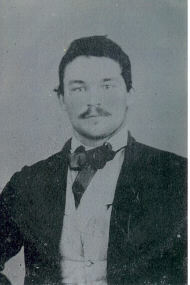 Twenty-year-old Rufus Jacklin enlisted in Brady's Sharpshooters in 1862, which was subsequently attached to the 16th Michigan for the remainder of the war. 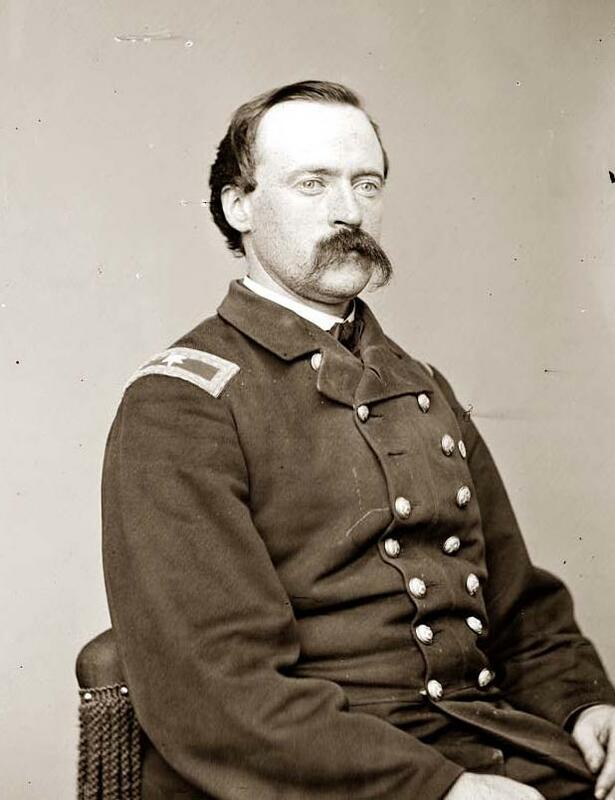 Lieutenant Jacklin served as regimental adjutant but often commanded the skirmish line. 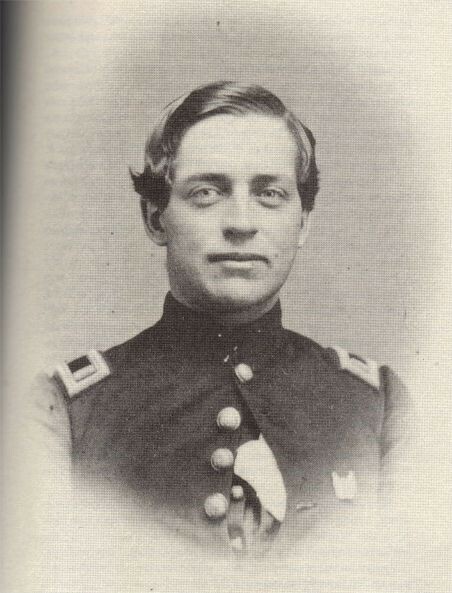 He was promoted to captain in June, 1864, and subsequently served as "chief of sharpshooters" for 5th Corps, where he commanded a composite sharpshooter battalion. Breveted to major in March, 1865, he was mustered out in July.